Hello, how do people deal with the issue of filling the ATO reservoir using Genesis ROCV and also filling the RO tank to make salt water later from one RO/DI system? i not sure if i get your question. but what i understand is you want to know how to fill ATO bin and Saltwater bin using this system. here is what i do. 1st barrel also is my ATO, when my saltmix barrel is near out i move whatever water is in the 1st bin and let ROCV come on and make fresh water. here i have 2 choices, 1 either i can let is make whole 55 gal and shut off and then i can move some of the water from there to saltmix bin or 2nd choice is which i do, i keep an eye on the 1st bin and keep moving water over to 2nd as its being made freshly and thus my 2nd bin is full while 1st is still being filled and then it shuts off on its own due to ROCV sensors. Generally I recommend simply placing a tee on the RODI output line and running one branch to the mixing bin, and one to the top off bin, with a 1/4-turn valve on each branch. Where the branches terminate in the mixing bin and top off bin, I place mechanical float valves; not only are they a great failsafe device, they also make it easy to affix the RO tubing to the bins. Under normal circumstances, I close the valve to the mixing bin and open the valve to the top off bin. Then, when I need to fill the mixing bin, I simply close the valve to the top off bin and open the valve to the mixing bin. Then I set the Auxiliary Mode on the STORM™ to "ON." The RODI unit produce water until the mixing bin is full, at which time the mechanical float valve will close, causing the water pressure in the RODI unit to increase until the RODI unit's automatic shut off valve stops the flow of water through the unit. Then, the next time I walk by and see that the mixing bin is full, I change the STORM™ Auxiliary Mode back to "ROCv™," close the 1/4-turn valve on the mixing bin, and open the valve on the top off bin. It sounds way more complex than it really is; it's really straightforward after you do it once or twice. There's really no need to "over engineer" it, because it's just so simple and easy to do. I've been pondering this and just posted a response to your other thread. Hey there. I've got Renew and Storm, but haven't set up yet since my build got majorly sidetracked. (almost done fixing the crappy mfg job Coast to Coast did and ready to move tank to its stand.....) I did, though, set up the fresh water supply system and the saltwater mixing system, and will try to describe here (after 1 a.m. ........) my setup is similar to bnumair's, but a little more robust. I, too, have SP UHE systm (albeit 200 gpd). (ABSOLUTELY LOVE IT and highly recommend it!!!) The SP feeds into a pair of 55-gallon Brut containers that are linked together, so I will have about 100 gallons of fresh when RO system shuts off. So now the question is what I do with the fresh water. I run a conduit along the floor from the bottom of the two brutes over to my saltwater mixing station, and I Tee off at the end of the conduit. 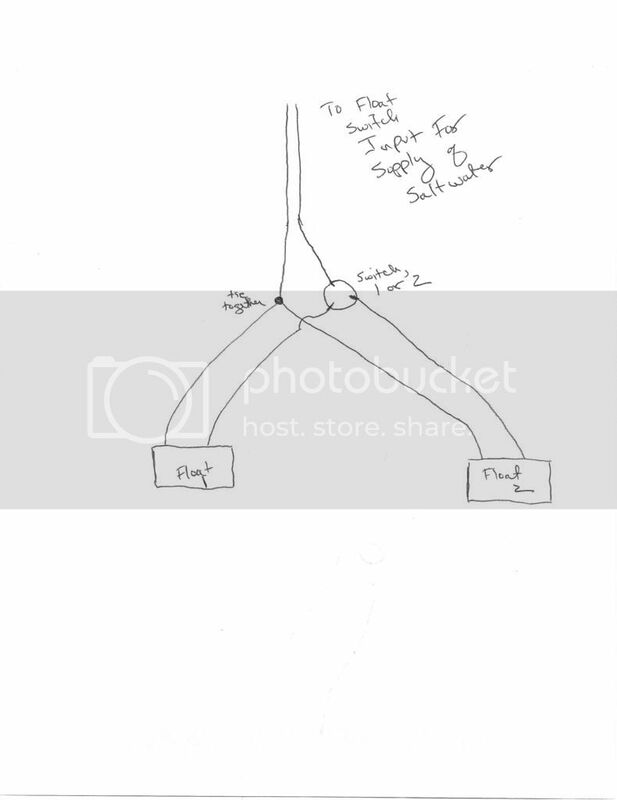 One branch from the tee leads to pump controlled by the storm, to pump fresh water into the system, and the other branch from the tee leads to a pump I use to supply fresh water into the saltwater mixing station. 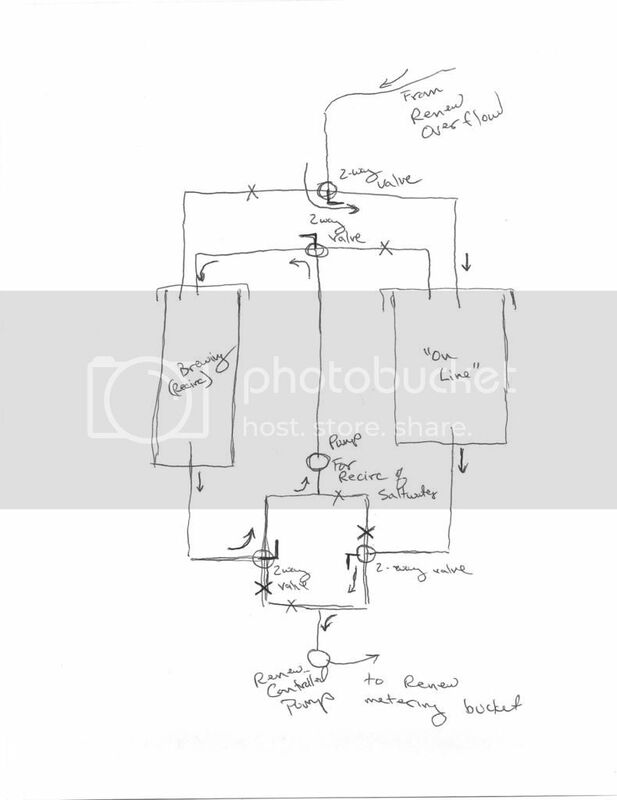 So with this arrangement, I don't even need the ROCv; toggling power to the RO system will kick it on easily enough (and float switch will shut it off), or the low switch on the RO system will kick it on if for some reason I don't go into the fish room for a few days to do so. Re the mixing station, I have two 55-gallon drums here, too! This way, one is "live" and being used to supply saltwater to the Renew system, while the other one is on standby with saltwater being brewed. 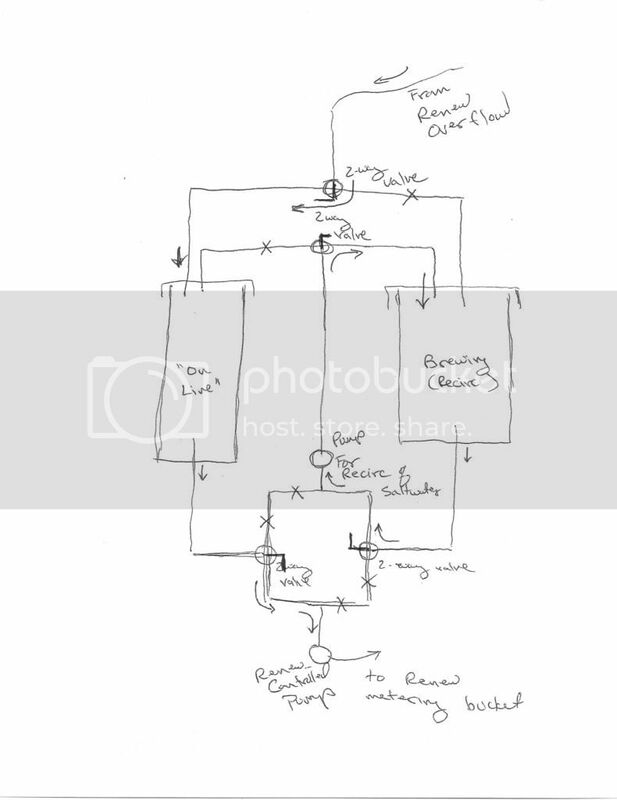 The pump I mention above to fill with fresh water is between the two drums, and there is a two-way valve I use to control where the fresh water is ported. Additionally, I set up a "circuit" of valves and pumps between the bins. One pump receives water from bottom of bins and pumps it back into the top, to circulate water through bin to keep saltwater getting brewed stirred well, the other pump receives water from bottom of bins and is used to pump water up to the Renew metering bucket. Overflow from metering bucket comes back down to bin, but is ported to the "live" or "online" bin (instead of the brewing bin) via another two-way valve. By throwing four different valve levers, I will cause saltwater to circulate out of bottom and back into top of one bin, while saltwater will flow out of bottom and be delivered to pump to Renew metering bucket from the other bin (and overflow will go back to that bin); reversing the four levers will reverse the roles of the two bins. As I write this, I realize it's probably pretty hard to follow. So I will definitely take and post some pix when I get home from in-laws! I think it's actually a pretty clever setup! Ok, further to my preceding post, here is how I have things set up. The first three sketches are as per the description above. 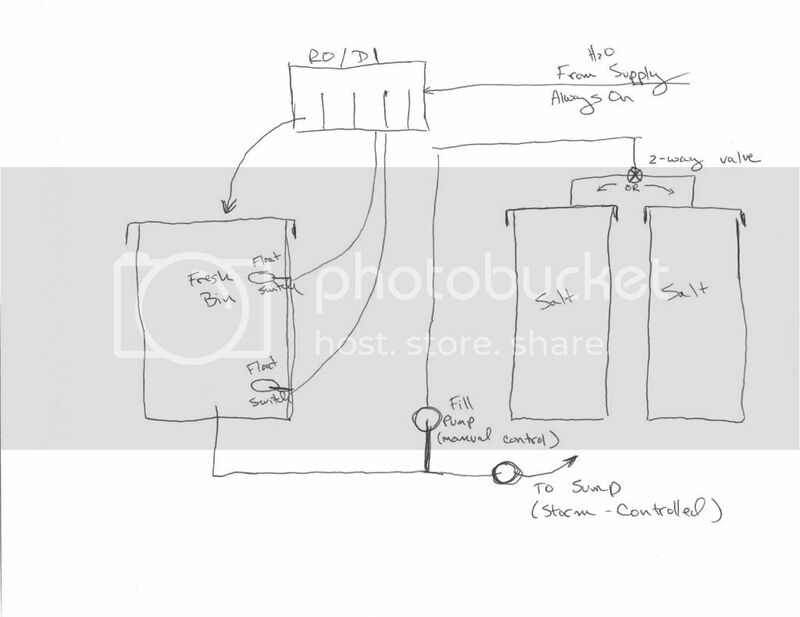 The fourth one shows how I have arranged a float switch in each of the saltwater supply bins (purchased an extra and some cord extender) to shut off the Renew system if the "live" or "online" system runs out of saltwater.